Synthetic biology and open-source applied biology tools that are pragmatic, safe and cost-effective have the potential to stimulate bioeconomic growth and address African challenges in healthcare, agriculture, education and the environment. OpenPlant is recruiting leading international experts from the UK and Africa explore the latest developments in synthetic biology, bioengineering and DIY biology, their potential as training tools for students and future innovators, and practical opportunities for deployment in Africa. 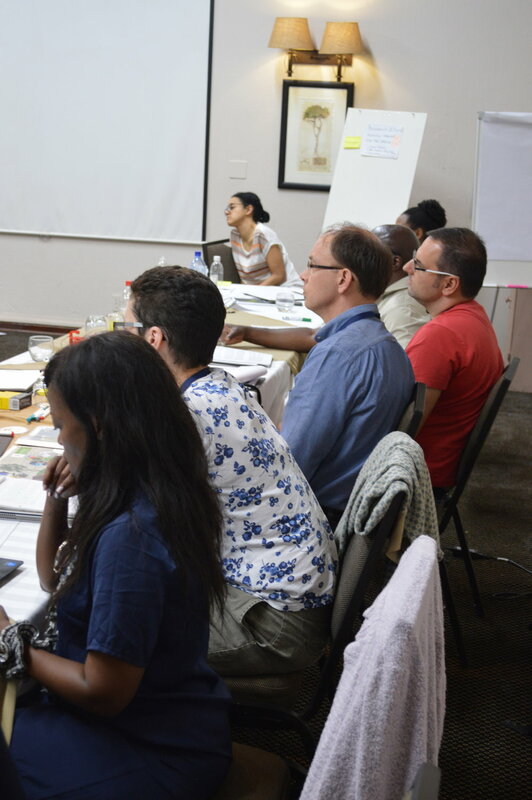 This effort has been started with a symposium and workshop was held in Pretoria and Bakubung, South Africa in February 2017, supported by the Global Challenges Research Fund (GCRF), a £1.5bn UK Research Council fund dedicated to the support of challenge-driven research in developing countries. Synthetic Biology is a new field, defined by the application of engineering principles and approaches to living systems. The field has triggered much excitement over prospects for improved bioproduction, remediation and waste treatment, new medicines and better crops. Internationally, there are large and on-going investments in these areas, which generally require substantial investment in laboratory infrastructure and the deployment of genetically modified organisms. Both of these issues can be highly problematic. BBSRC has funded a series of workshops in order to develop creative priority areas, identify research needs, strengthen established relationships, and develop new linkages relevant to synthetic biology that will impact international development and meet Official Development Assistance (ODA) criteria. The output of the workshops is expected to inform future Global Challenges Research Fund calls. The OpenPlant ‘Practical Synthetic Biology’ workshop addressed recent technical advances in biology that have given rise to a different class of cell-free and transient expression systems that are both cheap to deploy and have huge potential benefit for the provision of a wide variety of diagnostics, sensors, vaccines and research materials. We continue to bring together key UK and African scientists and application specialists to explore the development and deployment of these new systems, which (i) avoid the complications, delays and regulatory uncertainty associated with uncontained of GMOs, while (ii) providing high level, low cost training opportunities and capacity building. We chose Pretoria and nearby Pilanesburg as an excellent location for this international meeting. The University of Pretoria has pioneered African participation in the international iGEM Synthetic Biology competition. In addition, the University of Pretoria has initiated the construction of the Future Africa campus, intended to provide a place where Africa’s leading scientists and scholars from across the world and from a broad range of disciplines will come together to leverage the benefits of transdisciplinary research to address the grand challenges that face Africa and the world. Genome editing in orphan crops. To identify key problems that might be addressed by application of these technologies, to include field applications, research capacity building and education. To determine partnerships (who) and pathways (how) to find potential solutions and estimate the scope and scale of these proposals. To prioritise challenges and the potential UK-Africa collaborative activities that could address them. The workshop delegates identified several key areas that would benefit from future GCRF research funding in Africa. Specific areas where synthetic biology could provide solutions were identified as: production of vaccines and biologics, point-of-use diagnostics, improving agricultural crops using non-transgenic (genome editing) tools, and harnessing local biodiversity to build a sustainable bioeconomy. 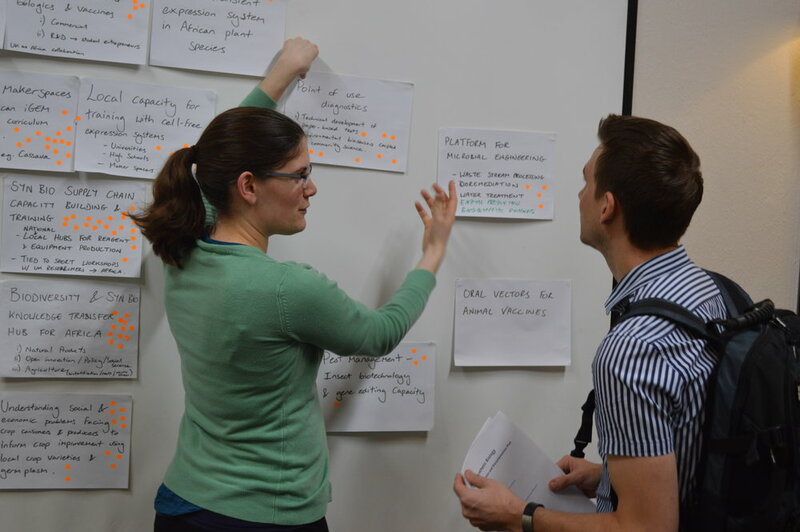 However, in every identified area, the group noted that projects were only likely to produce practical solutions and achieve social impact if there was a significant focus on (i) building local expertise in the necessary technologies through knowledge exchange (ii) establishing the necessary facilities and distribution centre(s) of open-source tools and materials, and (iii) developing tools for training and education in biotechnology suitable for use in resource-poor regions or institutes. The group concluded that an effective focus of future funding would be capacity building for the African bioeconomy. Following UNICEF’s Principles for Innovation and Technology in Development, which include the use of open standards, open data, open source, and open innovation, emphasis should be placed on the development of open tools, co-funded facilities and resources, enabling technologies and training in Africa in order to address urgent needs in medicine, agriculture and industry. The field of Synthetic Biology is introducing low-cost, breakthrough technologies for a wide range of practical challenges including diagnostics, environmental conservation, microbial bioproduction, crop improvement and human health. These are of critical importance to the future well-being and economic development of sustainable societies across Africa. Standardised, modular DNA parts and rapid assembly of genetic circuits for reprogramming biological systems. Cell free expression systems that do not require containment, and can be freeze-dried and stored at ambient temperatures to eliminate the need for refrigeration. Transient gene expression in contained hosts, and transgene-free genome editing to avoid the costs, resources and regulatory hurdles associated with the deployment of genetically modified organisms. Legal frameworks, repositories and open technologies for the open exchange of genetic materials. These new technologies are relatively low-cost, but their adoption in Africa is limited by deficits in technical training, poor access to new research materials, inadequate laboratory facilities, and lack of strategic partnerships with other African and international research institutions. The UK and Africa share a common goal with the need to develop improved synthetic biology training in schools, universities, community labs and industry. International efforts to develop open standards and protocols for DNA parts and tools will provide a major impetus for technology transfer to Africa. We recommend that (i) biotechnology is fertile area for UK-Africa exchange, and that (ii) capacity-building based on open technologies and exchange be a major component of any funding initiative. Synthetic biology can provide better solutions for: (i) rapid-response production of vaccines and biologics, (ii) point-of-use diagnostics and field biosensors, (iii) agricultural crop improvement using non-transgenic (genome editing) tools, and (iv) harnessing local biodiversity to build a sustainable bioeconomy. Standardised curricula for training and biotechnology education in resource-poor communities and institutes. Building local expertise through exchange and shared knowledge. Establishing in-country facilities for generation and exchange of open-source tools and materials. Dean was Director of the National Centre for Biotechnology Education (NCBE) at the University of Reading. The Centre, which was founded in 1986, develops low-cost molecular biology resources for schools and colleges, which are sold to 30 countries worldwide. Dean worked at the University since 1990 and was responsible for developing most of the resources sold by the NCBE, including the first genetic modification kit that could legally be used in European schools and bioinformatics teaching materials. He co-ordinated a 12-nation European Union-funded project 'Volvox', aimed at the electronic exchange of educational materials. He recent began to devise synthetic biology teaching materials that can be used within schools, while adhering to the restrictions that apply to genetic modification within the EU. Dean was formerly head of biology in a state secondary school in the UK and was awarded a fellowship to develop teaching materials at the University of Newcastle-upon-Tyne. He held an Honorary Doctorate from Gothenburg University. Dean developed some extraordinary teaching resources, which can be found at the NCBE website: http://www.ncbe.reading.ac.uk.